Nelson Rolihlahla Mandela (18 July 1918 – 5 December 2013) was a South African politician and activist. On April 27, 1994, he was made the first President of South Africa elected in a fully represented democratic election. Mandela was also the first black President of his country, South Africa. Mandela was born in Mvezo, South Africa to a Thembu royal family. His government focused on throwing out the legacy of apartheid by ending racism, poverty, inequality, and on improving racial understanding in South Africa. Politically a believer in socialism, he served as the President of the African National Congress (ANC) from 1991 to 1997 and adopted new Constitution of South African in 1996 that prohibits all discrimination, based on language, religion, handicap and sexual orientation, not only on racism. Internationally, Mandela was the Secretary General of the Non-Aligned Movement from 1998 to 1999. Mandela received more than 250 honors, including the 1993 Nobel Peace Prize, the US Presidential Medal of Freedom, and the Soviet Order of Lenin. He is often referred to by his Xhosa clan name, Madiba, or as Tata ("Father"). Mandela was described as a hero, and his actions gave thousands of people hope. Mandela was sick for several years during his retirement. He was hospitalized in late summer of 2013 from a continuous lung infection. Mandela died on 5 December 2013 in Houghton Estate, Johannesburg from a respiratory tract infection. He was 95 years old. Nelson Rolihlahla Mandela was born on 18 July 1918 in Mvezo, Umtata (now Mthatha), Transkei, South Africa. He had thirteen siblings by the same father, and two mothers. His parents were Gadla Henry Mphakanyiswa and Nosekeni Nonqaphi . His given name was Rolihlahla, a Xhosa name meaning pulling the branch of a tree or informally, troublemaker. He was a member of the Thembu royal family. On his first day of school, he was given the name Nelson by his teacher Miss Mdingane. Giving children in Africa English names was a custom among Africans during that period. Mandela's father died when he was twelve. Mandela then lived with the local regent who sent him to school. He was the first member of his family to go to a school. He was expelled from Fort Hare University in 1941, because he led a group of students on political strike. After he was expelled, Nelson found a job as a night watchman. In 1944, Mandela helped start the African National Congress Youth League. He was soon a high-ranked leader of the group. He wanted to free South Africa without violence, but the government started killing and hurting protesters. He then started Umkhonto we Sizwe with Walter Sisulu and other people in the African National Congress that he admired, such as Mahatma Gandhi. A trial was later held and became known as the Rivonia Trial. Mandela was on trial because of his involvement in sabotage and violence in 1962. He was sentenced to life in prison, and was sent to Robben Island, but was transferred to Victor Verster Prison in 1988. In 1990, he was let out of Victor Verster Prison after 26.5 years. He left prison after de Klerk removed a ban on the African National Congress. He ordered Mandela's release. He then received the Nobel Peace Prize in 1993, with former State President of South Africa, Frederik Willem de Klerk. Mandela moved into the Presidential Office of Tuynhuys, Cape Town. Mandela won the general election in April 1994. His inauguration was in Pretoria on 10 May 1994. Many people around the world saw his inauguration on television. The event had 4000 guests, including world leaders from different backgrounds. Mandela was the first South African President elected in a completely democratic election. As South Africa's first black President, Mandela became head of the Government of National Unity which was under controlled by the African National Congress (or ANC). The ANC had no knowledge in politics, but had representatives from the National Party and Inkatha. In keeping with earlier promises, de Klerk became first Deputy President, while Thabo Mbeki was chosen second. Although Mbeki had not been his first choice for President, Mandela soon trusted Mbeki throughout his presidency. This allowed Mbeki to organize policy details. 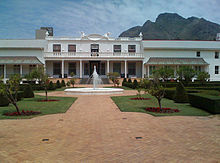 Mandela moved into the presidential office at Tuynhuys in Cape Town. He would settle into the nearby Westbrooke Manor. Westbrooke was renamed Genadendal. Preserving his Houghton home, he also had a house built in his home village of Qunu. He visited Qunu regularly, walking around the area, meeting with local people who lived there, and judging tribal problems. He faced many illness at age 76. Although having energy, he felt left out and lonely. He often entertained celebrities, such as Michael Jackson, Whoopi Goldberg, and the Spice Girls. He became friends with a number of rich business people, like Harry Oppenheimer and British monarch Elizabeth II on her March 1995 state visit to South Africa. This resulted in strong judgment from ANC anti-capitalists. Despite his surroundings, Mandela lived simply, donating a third of his $552,000 wealth to the Nelson Mandela Children's Fund, which he had founded in 1995. In that same year, Mandela published his autobiography, Long Walk to Freedom. Although in favor of freedom of the press, Mandela was important of much of the country's media because it was owned and run by many middle-class whites. Mandela became known for his use of Batik shirts, known as Madiba shirts, even on normal events. Mandela had never planned on serving a second term in office. Mandela gave his farewell speech on 29 March 1999, after which he retired. Mandela's term ended on 14 June 1999. Thabo Mbeki succeeded Mandela as President of South Africa. "We stand here today as nothing more than a representative of the millions of our people who dared to rise up against a social operation whose very essence is war, violence, racism, oppression, repression and the impoverishment of an entire people." Mandela was married three times and has six children. He had seventeen grandchildren, and a growing number of great-grandchildren. Though physically non-emotional with his children, he could be stern and demanding. Mandela married Evelyn Ntoko Mase in October 1944. They had two children. Mandela remained married to Evelyn until they divorced in 1957. Evelyn died in 2004. He then married Winnie Madikizela in 1958. They had two daughters. The couple filed for separation in 1992. They divorced in 1996. Mandela married again to Graça Machel, on his 80th birthday in 1998. She was the widow of Samora Machel. Machel was the former Mozambican president and ANC ally who was killed in an air crash 12 years earlier. Though publicly criticizing him on several events, Mandela liked United States President Bill Clinton. Mandela personally supported him during his impeachment trial in 1998. In June 2004, Mandela announced that he was retiring from public life. Mandela said "Don't call me, I will call you". Although continuing to meet with close friends and family, the Nelson Mandela Foundation denied invitations for him to appear at public events and most interview requests. On 27 March 2013, Mandela was hospitalized in Pretoria from a lung infection. It was reported on 28 March that he was responding well to treatment. Mandela was again hospitalized on 7 June from another lung infection, On 23 June, his condition was announced to be critical. On 26 June, it was announced that Mandela was put on life-support. On 4 July, Mandela's family announced that Mandela was under life-support and he was in a permanent persistent vegetative state. The next day, the South African government denied the fact that Mandela was in a vegetative state. Mandela was discharged from the hospital on 1 September 2013. Many South Africans thought that Mandela died overnight on 26 June after he was removed from his life support. The South African government said that Mandela is still alive despite the rumor that he died. It was later reported that the rumor was just a death hoax. CNN also reported that Mandela died, but later fixed the report soon afterwards. Photos were taken with Mandela and First Lady Michelle Obama as proof that Mandela was still alive. Mandela died on 5 December 2013 at his home at Houghton Estate, Johannesburg from complications of a respiratory tract infection, aged 95. He was surrounded by his family when he died. His death was announced by President Jacob Zuma. On 6 December, Zuma announced a national mourning for ten days. An event for an official memorial service was held at the FNB Stadium in Johannesburg on Tuesday 10 December. He declared Sunday 8 December a national day of prayer: "We call upon all our people to gather in halls, churches, mosques, temples, synagogues and in their homes to pray and hold prayer services and meditation reflecting on the life of Madiba and his contribution to our country and the world." Mandela's body lay in state from 11 to 13 December at the Union Buildings in Pretoria. A state funeral was held on Sunday 15 December in Qunu. David Cameron, Barack Obama, Raul Castro, Bill Gates, and Oprah Winfrey were there. On 28 June Mandela's family were arguing about where to bury Mandela. On 29 June the South African government announced that a memorial service for Mandela will be held 10 to 14 days after his death at Soccer City. On 1 July it was announced that if Mandela were to die he might become the first non-British person to be honored at Westminster Abbey. Queen Elizabeth II honored Mandela with a thanksgiving service at Westminster Abbey in early 2014. This made Mandela the first non-British person to be honored at Westminster Abbey. Mandela was buried in the village of Qunu in the Eastern Cape of South Africa. Qunu is where he grew up. In 1990, Mandela received the Bharat Ratna Award in India. In 1992 received Pakistan's Nishan-e-Pakistan. In 1992, he was awarded the Atatürk Peace Award by Turkey. He refused the award, because of human rights violations committed by Turkey at the time. He later accepted the award in 1999. In 1993, Mandela won the Nobel Peace Prize with F. W. de Klerk for their work during the civil rights revolution in South Africa. In 1993, Mandela received the key of the city of Chicago, Illinois from Mayor Richard M. Daley. In 2007, Mandela was honored with a statue in Westminster Abbey, London, England. In 2009, the United Nations made 18 July Mandela Day. In 2012, the Praia International Airport in Cape Verde was renamed as the Nelson Mandela International Airport. In 2013, a statue of Mandela was unveiled in the South African embassy outside of Washington, D.C.. The city of Johannesburg awarded him Freedom of the City. Sandton Square in Johannesburg was renamed Nelson Mandela Square in March 2004. The Nelson Mandela Bay Stadium was named in his honor. The Nelson Mandela Bridge, in Johannesburg was also named in his honor. Mandela was awarded the US Presidential Medal of Freedom by then-President of the United States George W. Bush. Mandela was awarded the Order of Canada. Mandela was the first living person made an honorary Canadian citizen. Mandela was the last recipient of the Soviet Union's Lenin Peace Prize from the Soviet Union. Mandela was honored with the Order of the Aztec Eagle by the Mexican government. A park in Leicester, England was named Nelson Mandela Park was named after Mandela. Elizabeth II awarded him the Bailiff Grand Cross of the Order of St John. Mandela was also awarded the Order of Merit by Elizabeth II. Mandela has been portrayed in movies and television. In the 1997 movie, Mandela and de Klerk, Sidney Poitier plays Mandela. Dennis Haysbert plays Mandela in Goodbye Bafana (2007). In the 2009 BBC television movie, Mrs Mandela, Nelson Mandela is played by David Harewood. In 2009, Morgan Freeman plays Mandela in Invictus (2009). Terrence Howard also plays Mandela in the 2011 movie Winnie Mandela. Mandela appeared as himself in the 1992 American movie Malcolm X. In Mandela: Long Walk to Freedom he was played by Idris Elba. By the time of his death, Mandela had come to be widely considered "the father of the nation" within South Africa. He is also seen as "the national liberator, the savior, its Washington and Lincoln rolled into one". Throughout his life, Mandela had also faced criticism. Margaret Thatcher attracted international attention for describing the ANC as "a typical terrorist organization" in 1987. She later made favors to release Mandela from prison. Mandela has also been criticized for his friendship with political leaders such as Fidel Castro, Muammar Gaddafi, Akbar Hashemi Rafsanjani, and Suharto. ↑ "Nelson Mandela, anti-apartheid icon and father of modern South Africa, dies". CNN.com. 5 December 2013. Retrieved 5 December 2013. ↑ "Methodists offer birthday salute to Nelson Mandela". Detroit Conference.org. Retrieved 4 September 2013. ↑ 4.0 4.1 4.2 4.3 4.4 4.5 "The Nobel Peace Prize 1993 Nelson Mandela, F.W. de Klerk". nobelprize.org. Retrieved 14 January 2011. ↑ 5.0 5.1 5.2 5.3 5.4 5.5 5.6 5.7 "South Africa's week of mourning for 'outstanding son' Mandela". The Guardian.com. 6 December 2013. Retrieved 6 December 2013. ↑ "Nelson Mandela's last remaining sibling dies in South Africa". Telegraph.co.uk. 30 January 2012. Retrieved 7 September 2013. ↑ "Gadla Henry Mphakanyiswa". Whoislog.com. Retrieved 21 August 2013. ↑ "Nosekeni Nonqaphi Fanny, Right Hand Wife (b. – 1968)". Geni.com. Retrieved 21 August 2013. ↑ "Nelson Mandela Short Biography". Short Biography.net. Retrieved 14 September 2013. ↑ 10.0 10.1 "Names-Nelson Mandela". Nelson Mandela.org. Retrieved 13 August 2013. ↑ "Nelson Mandela by Kadir Nelson". Barnes and Noble.com. Retrieved 21 August 2013. ↑ "Nelson Mandela quotes from QOTD.com". QODT.com. Retrieved 21 August 2013. ↑ "Nelson Mandela Biography". Notable Biographies.com. Retrieved 22 August 2013. ↑ "BBC News – South Africa's Fort Hare closed after violent protests". BBC News.com. Retrieved 22 August 2013. ↑ "Nelson Mandela: 1918–". Then Again.com. Retrieved 22 August 2013. ↑ 16.0 16.1 16.2 "African National Congress Home Page". ANC.org.za. Retrieved 21 August 2013. ↑ 19.0 19.1 19.2 "Mandela 'responding positively' to medical treatment". CNN.com. Retrieved 4 July 2013. ↑ "Nelson Mandela". BBC News.com. Retrieved 4 July 2013. ↑ "Mandela becomes SA's first black president". BBC. 10 May 1994. Archived from the original on 25 February 2013. Retrieved 26 May 2008. ↑ "Rondebosh – Cape Town – South Africa". Rondebosh.com. Retrieved 14 August 2013. ↑ "Nelson Mandela released from hospital". Telegraph.co.uk. Retrieved 14 August 2013. ↑ "Snapshot With Mandela – About Us". Snapshotmandela.co.za. Retrieved 14 August 2013. ↑ "Nelson Mandela spends birthday and wedding anniversary with Graça Machel, the wife who will never give up on him". Hello Magazine.com. Retrieved 13 August 2013. ↑ "About the Fund". Retrieved 13 August 2013. ↑ "Excerpts from Long Walk To Freedom". Archives.obs-us.com. Retrieved 31 October 2013. ↑ Khumalo, Fred (5 August 2004). "How Mandela changed SA fashion". BBC. Archived from the original on 25 February 2013. Retrieved 28 October 2008. ↑ "South Africa: Nelson Mandela and fatherhood – "Please don't call me a saint!"". Genderlinks.com. Retrieved 13 August 2013. ↑ Sharon Feinstein (16 October 2010). "Nelson Mandela's daughter: I don't know if my father loves me". Daily Mail. Archived from the original on 3 February 2013. Retrieved 3 February 2013. ↑ "Madiba bids final farewell to his first wife". Independent Online. 8 May 2004. Archived from the original on 25 February 2013. Retrieved 28 October 2008. ↑ "Winnie Mandela". ANC. Archived from the original on 22 July 2008. Retrieved 27 October 2008. ↑ "Mandela supports Clinton". BBC News.com. Retrieved 13 August 2013. ↑ "I'll call you". SouthAfrica.info. 2 June 2004. Archived from the original on 25 February 2013. Retrieved 26 May 2008. ↑ "Nelson Mandela back in hospital with recurring lung infection". The Star.com. Retrieved 4 July 2013. ↑ "Tribal chief hints that Mandela is on life support". MSN.com. Retrieved 4 July 2013. ↑ "Mandela on life support as family grave restored". MSN.com. Retrieved 4 July 2013. ↑ "Nelson Mandela being kept alive by breathing machine, facing 'impending death': documents". New York Post. Retrieved 4 July 2013. ↑ "Nelson Mandela in permanent vegetative state: reports". New York Daily News.com. Retrieved 4 July 2013. ↑ "South African government denies Mandela is in 'vegetative' state". Fox News.com. Retrieved 5 July 2013. ↑ "South Africa: Nelson Mandela out of hospital". USA Today.com. 1 September 2013. Retrieved 1 September 2013. ↑ 48.0 48.1 "Nelson Mandela Life Support Shut Down as Respected Humanitarian Dies Age 94? (UPDATE)". The Guardian Express.com. Retrieved 27 June 2013. ↑ "Nelson Mandela, father of a nation, dies aged 95". 5 December 2013. Retrieved 5 December 2013. ↑ 50.0 50.1 50.2 "Nelson Mandela funeral: South Africa enters 10 days of national mourning". New York Daily News.com. 6 December 2013. Retrieved 8 December 2013. ↑ Pillay, Verashni (6 December 2013). "Mandela's memorial service to be held on December 10". Mail & Guardian. Retrieved 6 December 2013. ↑ Vecchiatto, Paul; Stone, Setumo; Magubane, Khulekani (6 December 2013). "Nelson Mandela to be laid to rest on December 15". Business Day. Retrieved 6 December 2013. ↑ "Nelson Mandela funeral: what happens now". Telegraph.co.uk. 6 December 2013. Retrieved 6 December 2013. ↑ "Family argues over where to bury Nelson Mandela". MSN.com. Retrieved 4 July 2013. ↑ "Nelson Mandela Death Fears: Government Reveals Plan for Memorial Service at Soccer City". International Business Times.com. Retrieved 29 June 2013. ↑ "Nelson Mandela could be first non-Briton honoured in Westminster Abbey". Dnindia.com. 1 July 2013. Retrieved 7 September 2013. ↑ "Queen to miss Nelson Mandela funeral over security and long-haul flight concerns". The Independent. 2013-12-08. Retrieved 2013-12-08. ↑ "Nelson Mandela service at Westminster Abbey will be first for non-British citizen". The Mirror. 2013-12-08. Retrieved 2013-12-08. ↑ "Queen will miss Nelson Mandela's funeral and send Prince Charles in her place, say Buckingham Palace as David Cameron prepares to fly out for memorial service". The Daily Mail. 2013-12-08. Retrieved 2013-12-08. ↑ "Nelson Mandela's Birthday". Everydaysaholiday.com. Retrieved 3 July 2013. ↑ 66.0 66.1 "How the awards have just kept flooding in". The Cape Times. – via HighBeam Research (subscription required). 18 July 2012. Retrieved 14 February 2013. ↑ "Nelson Mandela in Chicago". NBC.com. Retrieved 23 December 2014. ↑ "Speech at unveiling of Statue, London". Sweet Speeches.com. Retrieved 13 August 2013. ↑ "UN gives backing to 'Mandela Day'". BBC News. 11 November 2009. Archived from the original on 14 February 2013. Retrieved 11 November 2009. ↑ "Cape Verde Names Airport After Nelson Mandela". All Africa.com. Retrieved 31 December 2013. ↑ "Mandela Statue Unveiled in Washington". Voanews.com. 22 September 2013. Retrieved 23 September 2013. ↑ "S. Africa renames Sandton Square as Nelson Mandela Square". Xinhua News Agency. 31 March 2004. Retrieved 28 October 2008. ↑ "Stadium Info". Nelson Mandela Bay Metropolitan Municipality. Retrieved 19 March 2010. ↑ "The Nelson Mandela Bridge". South Africa info.com. Archived from the original on 20 October 2011. ↑ "Nelson Mandela – Honourary Canadian". Ottawa Citizen.com. 19 November 2001. Retrieved 4 September 2013. ↑ "List of recipients of the International Prize for Human Rights". Algaddafi.org. Retrieved 5 September 2013. ↑ "Julio Ortega awarded Mexico's highest honor". News.Brown.edu. Retrieved 13 August 2013. ↑ BBC Leicester – Nelson Mandela Sports Festival. ↑ 82.0 82.1 "The Order of Merit". Royal Insight. November 2002. Archived from the original on 5 January 2005. Retrieved 26 October 2008. ↑ Keller, Bill (15 August 2008). "Entering the Scrum". The New York Times. Archived from the original on 14 February 2013. Retrieved 14 February 2013. ↑ "Exclusive photos: Jennifer Hudson and Terrence Howard in 'Winnie Mandela'". MSN.com. 7 August 2013. Retrieved 8 August 2013. ↑ "Idris Elba's 'Mandela: Long Walk To Freedom' Performance Showed To Nelson Mandela On iPad". The Huffington Post.com. 8 September 2013. Retrieved 21 October 2013. ↑ 92.0 92.1 "The 'terrorist' and the Tories: What did Nelson Mandela really think of Margaret Thatcher?". Independent.co.uk. 8 December 2013. Retrieved 8 December 2013. ↑ "Mandela And The Dictators: A Freedom Fighter With A Complicated Past". International Business Times. 18 July 2012. Retrieved 6 December 2013. This page was last changed on 12 July 2018, at 09:25.